Park at the Lower Cascade Fall parking area and walk the north side of the road until you see a rock wall which is the remnant of an old structure. From the wall, walk up to the cliff. You then turn right and walk along the wall. You will get to a step which you move around to the east (right) to a ramp. You should see an obvious, arching crack facing right (east). 3rd class up the ramp to a nice ledge just below the climb. You won't need to take a lot of gear for this one: #3.5, 2 #4 and 2 #4.5 (old camelot sizes). You might take some slingage and rings to use to setup a top rope on the tree above the climb. It doesn't get done a lot and our slings were left in December of 2006. Gary Carpenter taking another lap, at the layback. The route starts out wide, mostly fists and a bit wider. 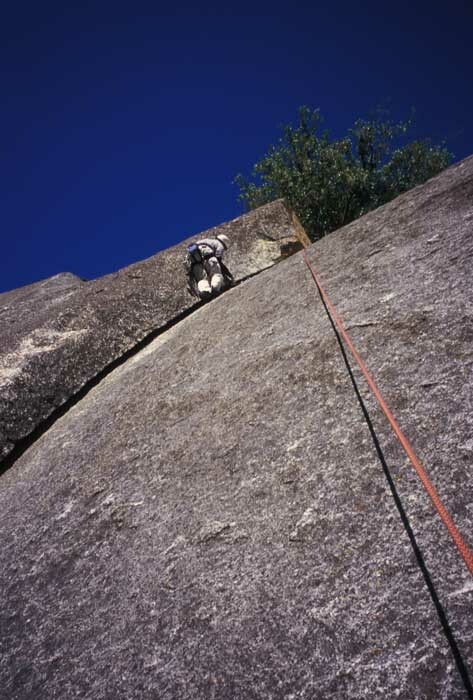 As you get to the vertical part of the crack think about the right time to pull into a layback. Then go for the edge. It\'s only 80\' long (if that).